This image shows a detail of a bronze statue of 'the Return of the Prodigal Son' by Karen Schmidt, inspired by a painting by Rembrandt (shown below). Rembrandt's painting was based on the parable of the prodigal son, one of 3 'lost and found' stories that Jesus told. The other 2 are the lost sheep and the lost coin. All 3 were told in respone to religious people grumbling that Jesus "welcomes sinners and eats with them". All 3 are parables of grace. The shepherd seeks his lost sheep until he finds it. The woman sweeps the house searching for her lost coin until she finds it. The father runs to meet and embrace his lost son. The shepherd, the woman and the father celebrate their joy with friends, neighbours and family. Neither the sheep, the coin, nor the returning son had done anything to deserve being found. The emphasis in all 3 stories is on the one who seeks what is lost and oveflows with joy at the finding. The seeking shepherd, woman and father show us something about the nature of God. 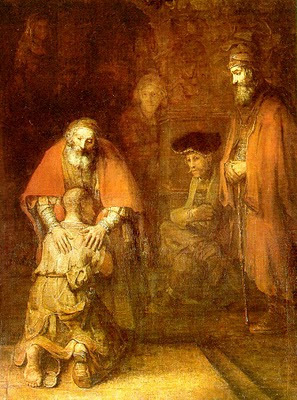 In Henri Nouewen's book "The Return of the Prodigal Son" he reflects on the father's hands as shown in Rembrandt's painting. The two hands are different from each other. “The father’s left hand touching the son’s shoulder is strong and muscular. The fingers are spread out and cover a large part of the prodigal son’s shoulder and back. I can see a certain pressure, especially in the thumb. That hand seems not only to touch, but, with its strength, also to hold. Even though there is a gentleness in the way the father’s left hand touches his son, it is not without a firm grip. This post is the 18th in a series of daily Lenten reflections based on a Bible reading from the Common Worship Lectionary of the Church of England. This one is based on Luke 15: 1-3, 11- end. Thank you for commenting Johan. I am pleased you found this encouraging.